In the kitchen, Pirman and Tetreault gather around a custom Corian island with a Tara faucet by Dornbracht. Vintage Cees Braakman Combex series chairs and a marble Florence Knoll table bring natural materials to an architectural shell built from concrete, glass, and steel. Benjamin Moore’s Tomato Red provides “punctuation” to the exterior. “That was the cheapest way to have that hot spark of color,” Pirman explains. Visitors to the house are greeted by an art-filled living room anchored by a B&B Italia Charles sofa and a pair of vintage Hans Wegner CH22 chairs. Track lighting from WAC Lighting Co. helps showcase individual pieces from the couple’s collection. “My favorite thing is walking in the front door,” Tetreault says. Pirman, an illustrator, works on a vintage Florence Knoll table in his studio at the front of the house. In the master suite, a painting by Eric Freeman hangs over a West Elm bed. 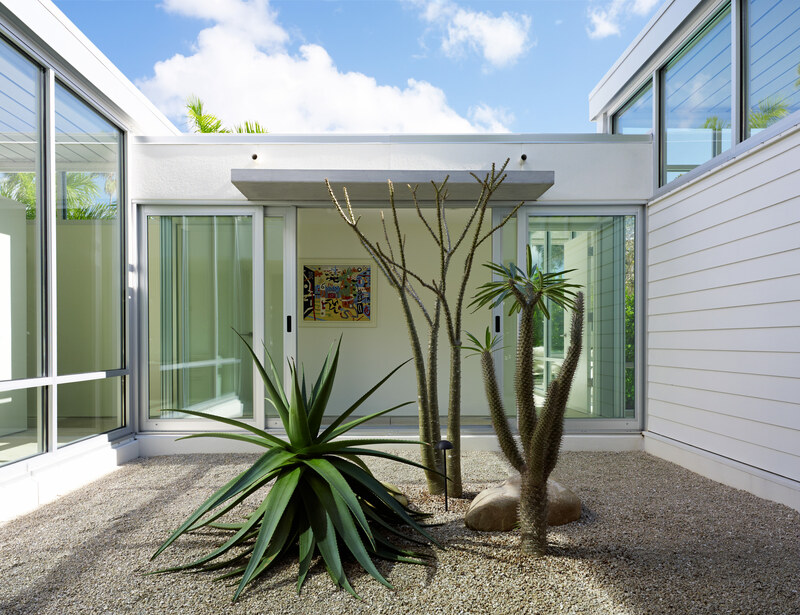 Sliding doors from PGT Industries open onto a courtyard planted with a giant aloe and two Madagascar palms. A Nordyne HVAC system embedded in the plinth helps the house keep a low profile. The siding is by James Hardie Building Products. Using a commercial roof in a residential project was a first for architect Michael Epstein. While similar systems are often covered, Epstein chose this long-span roof deck from Epic Metals for its beam-like interior face, which hides fastenings in its deep grooves, creating a flat-panel appearance. “What makes this house wonderful to live in is that the light is always, always changing,” says Pirman. Here, he adjusts shades fabricated by Unique Wholesale Distributors, which pull down in the morning when the sunlight is strongest. While the couple’s art collection is a focal point of the house, the structure’s abundance of glass walls means there are fewer places on which to hang it. Custom one-and-a-quarter-inch hardwood-plank shelves and a credenza from DWR provide places to rotate favorite pieces. There’s more to Sarasota, Florida, than warm waters and white-sand beaches. 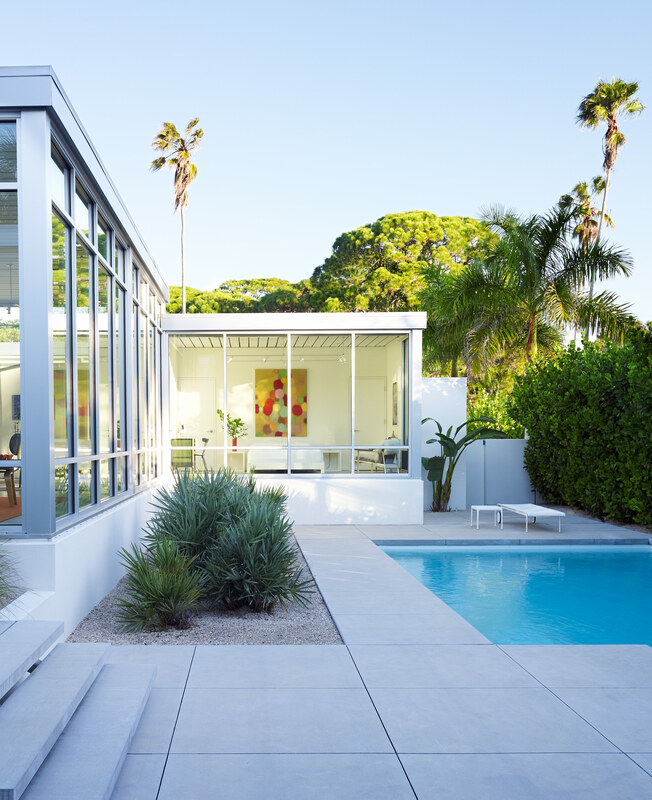 The city also lures design lovers with its wealth of low-slung glass pavilions created by Paul Rudolph and the architects of the Sarasota School in the construction boom that followed World War II. When hairstylist Steve Tetreault and illustrator John Pirman set out to build in Sarasota, they were well acquainted with Rudolph’s work. Tetreault owned a beach house by the architect, purchased some 30 years earlier on Siesta Key. Over time, the 950-square-foot retreat began to feel cramped as its role shifted to a full-time residence for two. 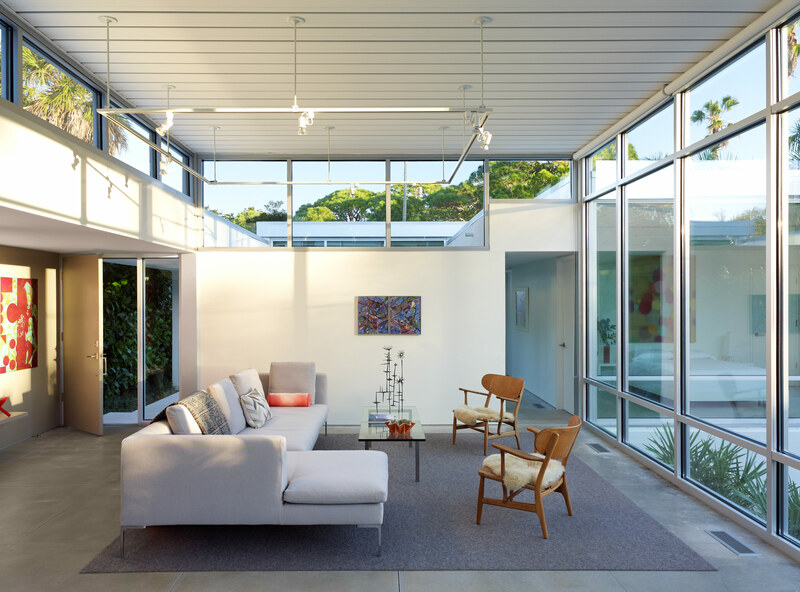 So, in 2008, Tetreault and Pirman called upon Michael Epstein of Seibert Architects—a firm opened in 1955 by Edward Seibert, who got his start working for Rudolph—to build a contemporary house in the modern style. But a half-century’s worth of building-code updates presented a new challenge: balancing midcentury aesthetics with today’s safety guidelines. Steve Tetreault: Looking to the future, we decided it might be nice to build a modern home. The economy was in the tank, land was cheap, and builders were dying to do stuff. This neighborhood was established by John Ringling in the late 1920s, and empty lots are rarely available. But there was a house that burned down, so we were able to buy a long, skinny lot that nobody really wanted. Then we went to find one of the original Sarasota School architects left in town to design the house for us. The style originated with them, so they’re totally in sync with our thinking. John Pirman: They used a lot of the concepts and proportions from the 1950s to build this house. Tetreault: Our first meeting, we had a few specific things in mind. We have an art collection that we wanted to hang on walls. John needed to have a studio to work in, and it was important to me to have a place to just get away and be quiet. So the architect put John’s studio up front, and the master bedroom is at the opposite end of this long house. Pirman: It’s pretty bare bones in its basic materials: concrete, steel, and glass. No frills, no adornments. The glazing systems are all storefront windows. The whole roofing system is a commercial application that you might find in an elementary school. They’re not necessarily that much less expensive than standard materials, but the labor costs are much lower. Tetreault: The original modernists were using materials that came off the shelf. We thought if it was good for them then, it’s good for us now. The only trick about this is the application has to be done perfectly. Since there’s nothing decorative covering up seams or anything like that, it has to be done by a craftsman who knows what he’s doing. Pirman: The house has a lot of integrity, because it’s Michael Epstein’s vision and he followed through. Every last corner detail was drawn on the paper. It drove the builders crazy, because they always wanted to cover something or change something. We all know that change orders equal dollars. Tetreault: We pretty much stuck to the plan. And I’m really happy we did. Pirman: Michael shared our aesthetic; he understood it. We worked intimately with him, but they were all his ideas. He listened to us, and we listened to him. That’s what I think made this house successful. It was a team effort. Tetreault: The difference between building in 1948 and building today has to do with codes. What they were able to get away with, which we aesthetically like so much—sliding glass doors with very minimal frames around them, and low, flat roofs—you would never be able to get away with now. The challenge then is to design something that gives us a lot of those ideas but still complies with today’s codes. The benefit of today is that my little Paul Rudolph beach house cost more to air-condition than this new house does—it was 950 square feet, and this is 2,500 square feet. The differences are this is insulated, the glass is all low-E glass, and the HVAC systems are so much better than they were then—they’re more efficient, and they cost less to operate. Pirman: Building the house was a roller-coaster ride. Now living here, it’s completely changed my life. I think this is the best thing that I’ve ever done.